When I look at the original pattern last spring I thought, hey I seen that kind of brass compass this should be easy to make. The funny part is I looked and looked for one of those and could not find one no matter where I looked. 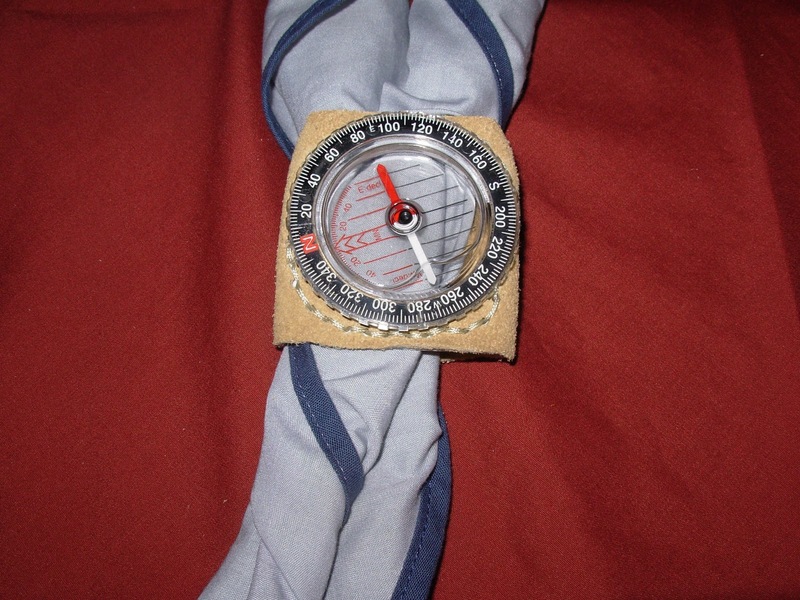 Oddly enough, I was packing my backpack for a hike on the AT and discovered a compass I found at summer camp. The compass was tossed in the wood by someone because it would not turn on it's base. Not wanting to leave it there, I put it in my pack to throw it away later. Now I had an idea, I broke the compass away from the base and cut a piece leather for the slide. Next I needed to fasten the compass to the leather. I could have just glued it to the hole in the leather but I wondered if I could make it so it would turn. I needed to find something strong enough to whole the compass in place but thin enough so I could use it with the leather. Cutting some plastic from an empty orange juice container, the plastic worked like a charm since it was pliable enough to fit over the flange in the back of the compass. I also decided to sew the plastic to the leather for more support. Now I have a workable compass slide.